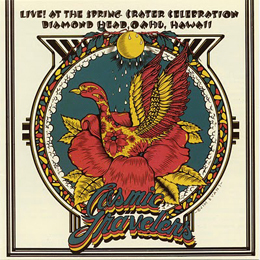 Cosmic Travelers was a short-lived live project that resulted in a sole, self-titled album in 1972. With the record company Volcano closing soon after its release, the album was quickly deleted. The GearFab release of Live! At The Spring Crater Celebration-Diamond Head, Hawaii (full title) includes six tracks and runs the standard length of an LP of the era (about 40 minutes). Cosmic Travelers fuse a blend of blues, rock, jazz, soul and funk with a knock-‘em-down, free-wheeling sound. They have borrowed heavily from rock heroes Allman Bros, Santana, Grand Funk and Jimi Hendrix even a tint of the James Brown soul jam style is evident. They have taken the wailing guitars, soulful vocals, and groove feel, and have added funkadelic wah wah effects. The group’s pleasure at being on the stage together is evident.